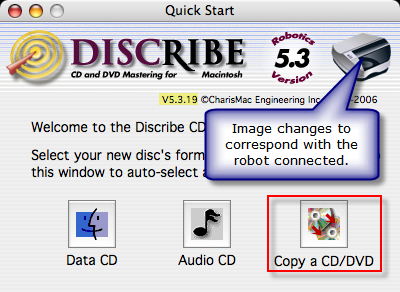 Discribe can create CDs or DVDs by copying a source disc in a CD/DVD Reader drive. Use this method to copy any CD or DVD including audio CDs, data CDs, video CDs, data DVDs, video DVDs etc. 1. Double click the Discribe Icon to launch the program. You will see Discribe's Quick Start Menu. 2. Click the Copy a CD/DVD button. 3. Place your master disc in your Bravo's drive. Important Note: You must place your master disc in the drive AFTER you open Discribe. If you receive a message regarding mounted volumes at this point see this article. 4. (1) From the drop down menu, select the drive in your Bravo as the Source. At USB means the drive is in your Bravo. 5a. (2) Click the Burn button. 5b. At this point, if you are using a BravoPro or XRP for the first time on this computer, you will be prompted, "You must choose a robot and a recorder to write a disc." Click OK. The screen below will appear. The robot should automatically be selected. You will need to choose the top and bottom drives. After you make this selection, Discribe will remember it for future jobs. You will not have to select them again. If you make a mistake or would like to check your selection choose Test Robotics from the Utilities menu. Click Open for each of the drives "1:" and "2:" to determine which drive is on the top and which is on the bottom. Set the location appropriately. Click OK. Click "Burn" again to proceed to the next step. 6. 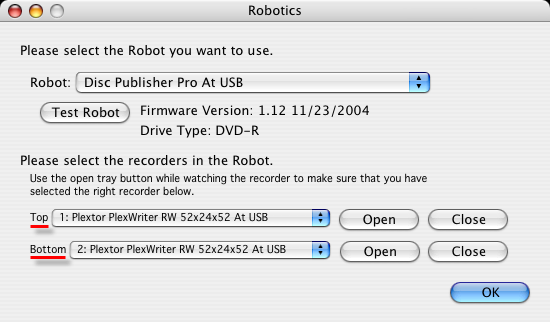 The Robot Write Options window will appear. It contains selections to help you control the printing of the image, number of discs, recording options and more. Check the Print Image on Discs box to enable printing. This will enable other buttons in this pane. Leave it unchecked if you do not want to print an image on the disc surface. (1)Press the Choose Image button to select an image to print. This will allow you to select any file type Apple's Preview supports including JPEG, TIFF, PICT, PDF, GIF, BMP and more. (2) YOU MUST CLICK Page Setup and set Format For to Disc Publisher (II, Pro, XR, XRP, SE)! Set the Paper Size option to CD/DVD. (3) Print Settings (optional) will launch the Printer Driver settings when clicked. Adjust these settings accordingly or leave them at the defaults. You may want to adjust inner diameter and outer margin if you want your image to cover the entire surface of the disc. (4) Select the Number of discs requested for this job. (5) Click Start. A message will appear "Write the data and finalize the disc?" Click OK. Your job will now start. The remaining options can almost always be left to their default values. An explanation of each is below. Kiosk Mode will allow you to increase the capacity of your Bravo from 25 to 50 (BravoPro from 50 to 100) discs by dispensing finished discs out the front of the unit instead of dropping them to the output bin. This allows you to place blank discs in both the input and output bins doubling your capacity. An optional Kiosk Kit is available from your Primera reseller that contains a custom output bin to catch the finished discs as they leave the Bravo. Set Print on disc before recording/Record disc before printing. Record disc before printing is recommended for most jobs to avoid printing on discs that do not burn properly. Print Before Recording is used for jobs involving Hockey Rink or Business Card shaped CD-Rs where it is important to print before recording for proper card alignment. 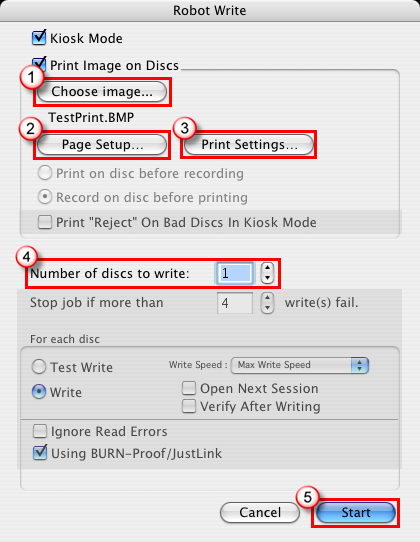 If using Kiosk Mode, choose whether or not to Print "Reject" on Bad Discs in Kiosk Mode. When enabled, this will cause a disc that has failed to verify to be printed with the word REJECT prior to being ejected from the publisher to make it easier for bad discs to be identified in the output stack when using the Kiosk Mode. If this option is not enabled, bad discs will be ejected with no printing at all. Stop Job after Number of Writes Fail allows you to decide how many consecutive failures the Publisher will accept prior to canceling a job. Test Write sets the burn laser to read intensity and simulates a burn but leaves the discs blank. Write Speed controls the speed of the write. Lower the speed if you are having recording problems. Check Open Next Session if you are burning data to a disc and you would like to append more data to the disc at a later time. Check Verify After Writing if you would like Discribe to compare each burned disc against the source for accuracy. This is useful for installation discs where it is extremely important that every bit of data be accurate. This is not as necessary for video or audio discs where a missing bit of data may never be noticeable by human eyes or ears. Checking this option will double the total record time of the project. Check Ignore Read Errors if you know your master may have scratches but you would like to copy it anyway. Be aware that copies may not be playable or may have noticeable quality problems. Always check BURN-Proof/JustLink. This prevents bad discs resulting from inadequate hardware.